The Game Mechanic: Forging "Blade Bind"
The game-world is going to be fairly vague, although I'll probably outline a modern-day and fantasy setting. The game focusses pretty strongly on the Chosen wielders of the Blades and their personal struggles, so the shape of the world around them is only as important as the players want it to be. Blade Bind kind of has two parts at the moment – the duelling system, and the drama system. The sword-fighting system uses regular playing cards. It's going to be the only real resolution system in the game – if you can't fight over it, it's not worth "drawing" for. I've used my several years of historical swordsmanship to come up with a quick, abstracted system that captures the feeling of actual sword-fights without getting bogged down in modifiers and fiddly split-second manoeuvres. I came up with the basic system pretty quickly, although there are a few variant rules I want to playtest before I settle on a final build. I'm also pretty confident that it'll be able to handle a free-for-all melee rather than simple one-on-one duels. Unlike Thunder Hunters and Neon Burn, I'm actually finding it relatively easy to expand the duelling rules and tie other parts of the game into the system. Perhaps it helps that the game is even smaller in scope so it has fewer moving parts, or that I'm embracing abstract mechanics and not worrying too much if the mechanics are leading the fiction – or maybe it's because I've just had more practice! Best of all, the duelling system leads to very quick fights, and combines luck with strategy. There are a number of approaches you can take when facing an opponent, and there are some nice emergent qualities that mean fights are never predictable. Differences in character power-levels do make a difference, but there's always a chance the less-skilled fighter will come out on top. I had a few things in mind that I wanted to include: a web of interconnections that set the characters at cross-purposes right from the start; the struggle for control versus the temptation of greater power; and a rapidly-evolving situation that challenges the status quo from the very first scene. I've tied all of those things together, hopefully creating an engine that will spew forth melodrama and tragedy. Each character has a Will and a Power score. Will is based on the number, type, and current status of your Threads – so it can fluctuate as you lose them, complete them, or gain new ones. Power starts at 2 or 3; you can put it up by 1 at the start of any duel, and it also goes up by 1 whenever you lose a fight. If Power ever exceeds Will, the Chosen succumbs to the will of the Blade and they become "Bladebound". While in that state, the character is a demon on the battlefield who will lay waste to anything that stands in their way. The basic procedure will be to go around the table and have each player set a scene for their character. 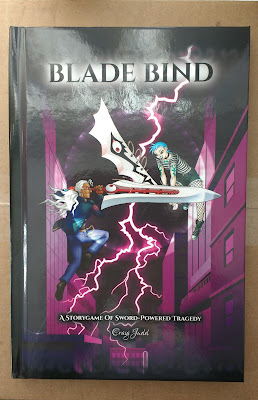 Apart from the other characters, there's nothing in the way of them just going and achieving their goals – the Blades give the Chosen powers beyond the ken of mortals, and no ordinary foe can stand before them. So things should get violent and messy in short order. Thematically and mechanically, the game is inspired by three other games – one I've played, one I've read, and one I've only backed on Kickstarter. Eternal Contenders is a really cool GMless game of duelling fantasy warriors that I've played a few times. It also uses cards for resolution, although mostly just by colour (red=success, black=nothing). The duels tend to take a lot longer than Blade Bind's, probably because it's based on a boxing RPG where fights can really drag out. Each fighter also has Hope and Pain scores that track how dangerous a fighter they are, and how likely they are to achieve a happy or tragic ending. Ironically, putting everything into winning fights provides the greatest chance of a tragic ending, and to have any hope of happiness you really need to give up on victory... while at the same time, victory is your surest means of securing Hope. It's a fine balance, and one I've yet to master, but it's also the sort of painful choice I want to build into Blade Bind – succumbing to the lure of power will turn you into a tragedy engine. Wield is also GMless, and is about playing as magical artefacts that vie for control over their wielders. While Blade Bind is about playing the Chosen rather than the Blades, it's also about that fine line of control. When someone does cross that line, they're effectively playing the Blade instead. Shinobigami is a recently-Kickstarted translated version of a Japanese RPG. It's very PVP-oriented, and has a really abstract way of approaching things mechanically, which has given me a lot of confidence to go ahead with a game that doesn't pay much attention to the way things are traditionally done, and that merges elements of board/card games with RPGs. I need to playtest the duelling rules a bit more to figure out which variants to go with. I'm also in the process of drafting the Threads, Will/Power, and Special Manoeuvres, so when I'm not playtesting I'll be trying to beat those into some sort of prototype shape. I'm also working on a few RPG-related freelancing jobs lately, which I should talk about in a future blog post! Work has been going nicely, although I'm always on the lookout for new editing and layout jobs. Let me know if you need some help on your own project, or if you've seen something I could apply for!